Tangier Lane & Neary's Bar, Dublin 2 as part of No Respect curated by Alan Phelan and Jane Speller. No Respect curated by Alan Phelan and Jane Speller commissioned six artists to respond to projects by international artists in Ireland which were never sucessfully realised. The resulting exhibition is located in a number of Dublin city locations and comprises of a series of temporary public art works including sculpture, video and sound works. However following bankruptcy of Turske’s Zurich Gallery, claims of finacial mismanagement and non-payment the reationship between Turrell and Turske broke down and the artist withdrew from the project. 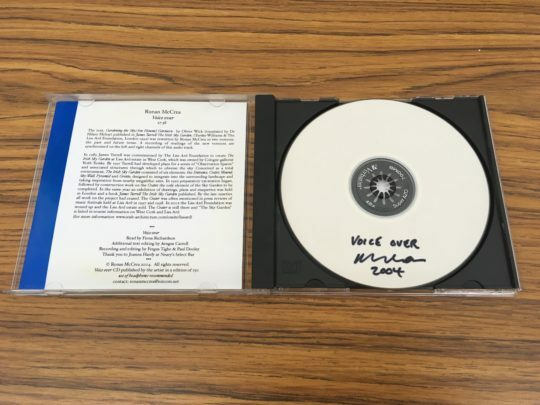 Work on the site was abandoned, and the project was disowned by Turrell, who was later reported in an 1994 article by Nicholas Fox Weber in Art & Auction as saying “At this point, I remove all authourship from this work in Ireland. It ‘s not my work. 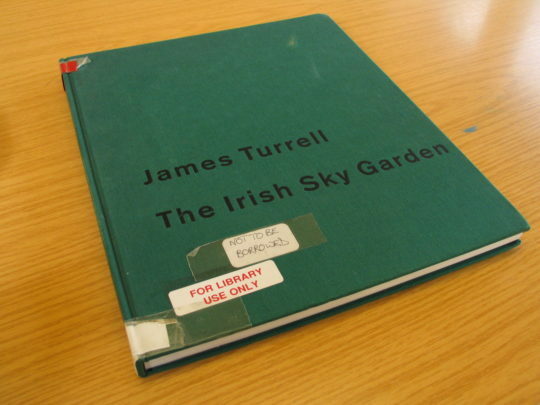 The sky Garden is my title, not his (Turske).” In his article Fox Weber provides background story of the Turske, Turrell and the Irish Sky Garden, which can be read in full here. The Liss Ard Foundation was dissolved, and the estate sold. Veith Turske is now apparently a yoga teacher. The work is not listed on offical James Turrell website and the artist is still credited with the work the by current owners of Liss Ard Estate. Voice Over is an audio work that involved re-writing in two versions a text ‘Gardening the Sky / Am Himmel Gärtnern’ by Oliver Wick (trans. 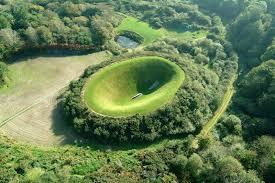 Dr. Hilary Hetlay) published in the book, James Turrell; The Irish Sky Garden (pub. Turske -Williams, Liss Ard Foundation 1992.) The essay describes in present tense register the imagined experience of the the yet to materialise Sky Garden artwork. For the audio work the essay was re-written in the past tense, and again in the future tense. The new ‘past’ and ‘future’ versions were recorded as a voice-over in an interpretative centre style and synchronised on the left and right stereo channels of the audio track. For the exhibition the audio first was installed on speakers in Tangier Lane, Dublin 2, then relocated on to Neary’s Bar, Chatham Street, where the work was available on head-phones. No Respect was accompanied by a publication with essay by Cherry Smyth. NO RESPECT asked artists to respond to projects by international artists in Ireland which were never successfully realised. Projects referenced include Jean-Claude and Christo’s attempt at wrapping the pathways of St Stephen’s Green, James Turrell’s Sky Garden land art project in Cork, or Richard Serra’s monumental steel sculptures. The resulting exhibition is located in a number of Dublin city locations and comprises of a series of temporary public art works including sculpture, video and sound works. The six artists selected for the project have created a new work based on a failed project. NO RESPECT aims to revisit public art projects by famous artists which have failed to win approval by the authorities and/or the general public. Working in the public realm has never been easy for artists, both practically and politically. Public authorities and audiences often rightly question the assumed right of the artist to impose art on people because it is perceived as being ‘good for them’. NO RESPECT is interested in the possibility of failure viewed as the opportunity for an aesthetic of invisibility, of the elusive and ephemeral. The curatorial concept is to present a series of perplexing situations that disturb the familiar and comfortable conventions of presentation and interaction between a work of art and its public. There are a variety of functional ambivalences built into this exhibition as we want to exhibit work that is temporary or moreover provisional in its objecthood. These are intended to create hybrid situations that merge forms, contents and contexts through engaging the history in the present, forcing provocative and marginal positions between audience, artist and sites. An information area with site map is installed in the lobby of Project, East Essex Street. NO RESPECT is an artist-led group based in Dublin which organises exhibitions and publications.